“I don’t know if you remember from last year, but I’m the one organizing the College’s annual remembrance displays for the 6 Dec massacre of women at the Ecole Polytechnique. What we are doing this year are stories of people who remember that day – members of the military and faculty and staff. 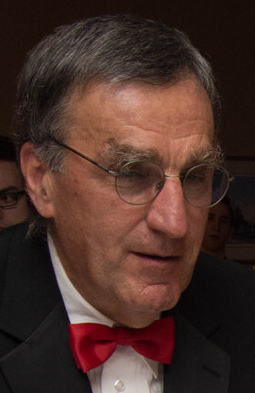 Steve Lukits was a rookie editorial writer at The Kingston Whig-Standard in December 1989. Writing for a living was his daily job for 13 years at the ‘Whig’, where he was an editorial writer, executive and editorial page editor, and from 1999-2002, the paper’s editor-in-chief. The RMC Associate Professor, from the English Department staff came to the journalist’s job after earning PhD and Master’s degrees in English at Queen’s University. He taught part-time there, as well as at the University of Manitoba. Them! They did it! Hear the rage and follow the accusing stare and the pointing finger to the others, those who are not like me, but different in some threatening way. They hurt me! They scare me! And when the words, glaring eyes and muscles lunge in brutal violence, there is the promise of relief. Now I’ll get them! Maybe Marc felt something like this when he walked into the engineering building at the Universite de Montreal, pulled out his automatic rifle and killed 14 women. For Marc, they were woman, those he separated from the men in the classroom before he started shooting. Then, devastated by madding hate, or blindness, or guilt, or exaltation, or self-loathing, or whatever he felt after killing the women, he killed himself. They were also “a bunch of feminists,” as Marc had screamed at the women. In the three-page letter found on his body, he wrote that “feminists have always spoiled my life.” Now his enemy had a recognized, different shape and a name. And before we begin to distance the killing in Montreal by setting up the “madman woman-hater” and “feminists” as the warriors, maybe each of us should consider our personal contribution as a guilty party to these battles. How many times, when wronged by lawyers, cops, bureaucrats, politicians, have each of us cursed them as a group and so forgot the individual women or men in the group who have not offended us. Only small, but crucial gaps between hatred, anger and violent action separates these little outrages of everyday life from the murderous outrage in Montreal. We must resist the easy urge to transform individual women and men into faceless groups, into names of derision, into objects of hate. And we must begin this resistance not by only watching and reading about the Montreal killings, seemingly removed from the horror. The potential for that horror is in each of us. If we refuse this private pause of inward reflection and only look outward to the terrible event, we may develop immunity to the hatred and violence we witness in the world around us. We must try to reach out and touch people. Or we risk turning the victims of our hatred, as human beings have done so many times before in our sad history, into them, the saddest of biodegradable garbage. Kelly Lupton, RMC’s Deputy Manager PSP, experienced something new on RMC campus the other day: she had a conversation with a stranger about a series of posters that have appeared around the peninsula. “Who talks about a poster?” Lupton mused, but from the Messes to the Library, and the classrooms and corridors in between, people are talking and reading. The black, bilingual posters, which ask the viewer “Where were you? Où étiez-vous ?” is the newest RMC installation to commemorate the 6 December, 1989 massacre of 14 female students at Montreal’s École Polytechnique. LCol Art Jordan and I, co-coordinators of the annual installation, began the project back in September, when we asked members across the RMC community to contribute their own memories of that terrible day. 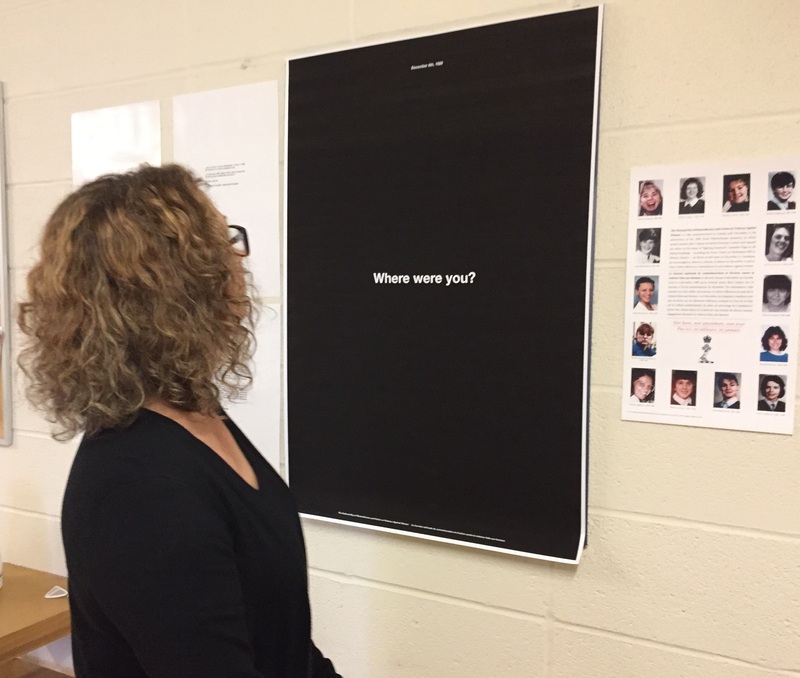 Those memories, which soon appeared in long rows next to the questions, are now visible across campus, allowing students, staff, and faculty to read the experiences of their colleagues and friends as they move through their own university space. There are a surprising number of memories from people who were at school themselves when it happened: taking exams, writing papers – or who even knew people who were at the École. Sharing these stories collapses the temporal as well as emotional distance between then and now, and doesn’t allow us to think of the event as separate from our own experience. This year the Cadet and the Senior Staff Messes will again host empty tables. Massey Library has a portrait gallery. As people look at the portraits, read the names, consider their own colleagues’ memories, and share their thoughts, we move, in Toomey’s words, “from betrayal to disgust…to resolve.” RMC remembers. December 6th 1989. 16h30. Snowy night. I was in a cab from the bus station to my new apartment on boulevard Edouard-Montpetit, in front of La Poly. Excited to settled down to a new chapter of my life after leaving RMC in May 1989. I was about to go to HEC. Just weeks before, I was still balancing between going back to engineering at Poly or pursuing Commerce at HEC. I chose HEC because of “them”. “Them” being women. HEC was at least 50-50 in gender split and Poly was maybe 90-10. Being 21, well…I chose the greater number and a career in business. Back to my cab: the cab driver told me he wasn’t sure if he could make it because something weird was happening “over there”. The news on the radio were very confusing. I finally made it to the apartment which was full of people. My new roommates were from Poly – smack in the middle of it. They brought a bunch of friends with no coats and boots to the apartment until the dust settled down up there. It was quite an atmosphere. Sobbing, crying, low voices, confusion…to this day I still have shivers thinking about that night. Being from RMC, I understood what standing with and for my comrades meant. That night, I think my new friends lived it at 200%. I felt powerless in front of the horror of the moment. I sincerely think that it reinforced an already very strong feeling of gender equality that I had. In my career afterwards, I have always preferred working with women. Because what makes them “them” is what makes “us” stronger. Thank you Louis for sharing your experience, I loved your last two sentences. It is sad to think that it takes such tragedies to have perspectives change in some people. It’s the business school affiliated to Montreal University (UdeM) just as Ecole Polytechnique is the engineering school affilited to UdeM. I was 3 years out of RMC, and just starting to really appreciate the fact that the small numbers of women in engineering weren’t just because there were small numbers of women in total at RMC. On the day after the massacre, I was visiting a defense contractor in Boston. The armed (civilian) security guard started telling me that the massacre wouldn’t have happened if we didn’t have gun control because someone would have shot the gunman. There were more firearm-murders in Boston that day ( and most other days) than there were in Montreal – cities of about the same size at that time. Gun control works.